I wanted to finally get around to posting the pictures of the Christmas present I put together for my father this past holiday season. Earlier in 2012, I’d shared The Night Circus with him and he LOVED it. He especially loved Frederick Thiessen and the reveurs, who go to the circus wearing black and white – to be more a part of the circus’s aesthetic – but differentiate themselves from the performers by wearing a splash of red. He mentioned that he was going to get a red scarf to be just like them, but I knew he wouldn’t. So I ordered one for him, as well as a copy of the book, and decided to do a Night Circus-themed Christmas gift for him. 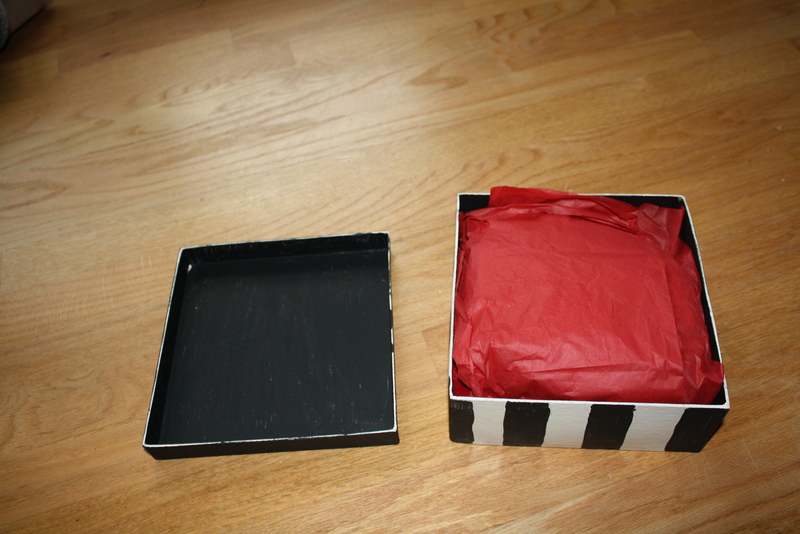 Color scheme was easy – black, white, silver, and red. Okay. So I went to the craft store and got one of those kraft boxes – not the wooden ones but the hard paper ones – and a piece of red velvety paper from the scrapbooking aisle. I also scored a packet of pocket watch scrapbook embellishments in varying colors – black, white, silver. Awesome. Black ribbon, check. 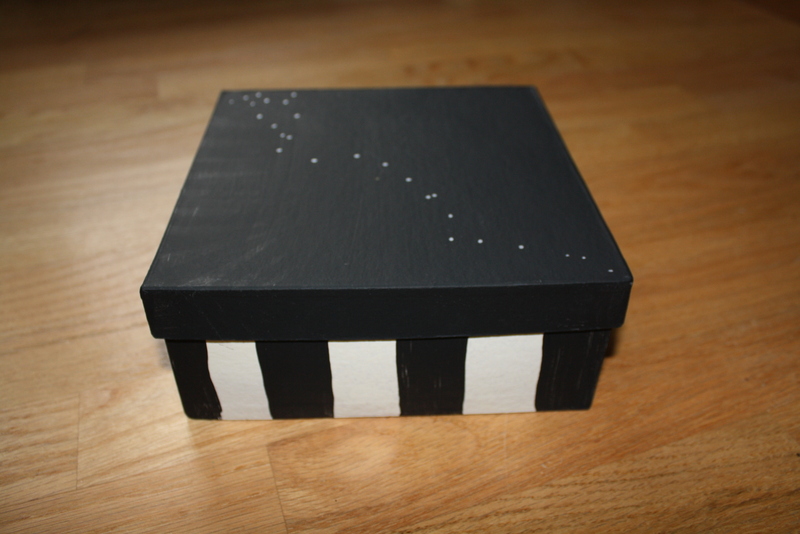 The painted box. I did circus stripes on the bottom and a black top with the star pattern found on pages throughout the book. Here’s inside the box. Black. I originally was going to draw Marco’s tree but then decided to just keep it simple. 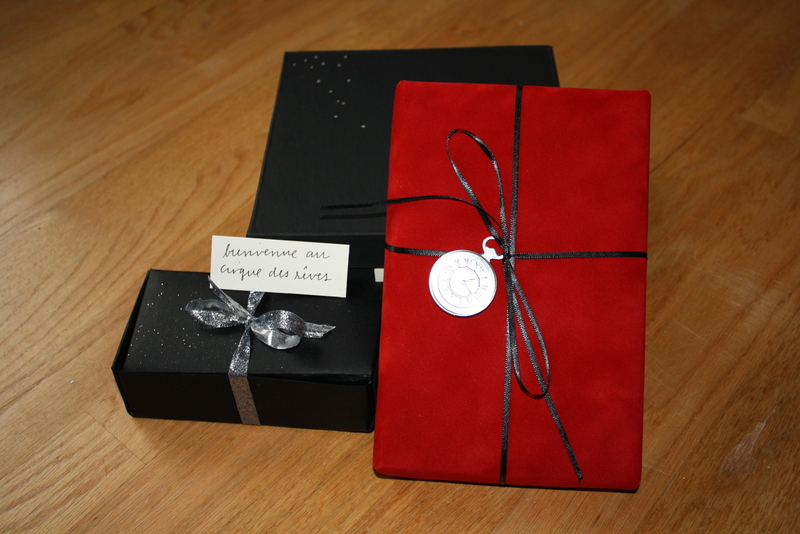 Here’s the box with the red scarf in red tissue paper. Suddenly, it’s a lot more colorful! 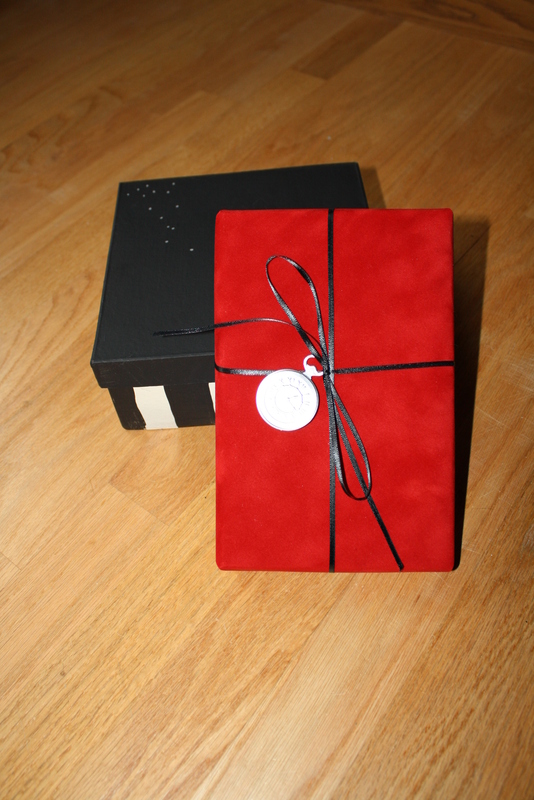 The box, along with the book wrapped in the red velvety paper. It’s tied with black ribbon and accented with one of the little pocket watch tags – appropriate, I thought, since Frederick Thiessen, who starts the red-scarf thing, is a clockmaker. Here’s the gift with the addition of 8 truffles in dark and white chocolate. I didn’t have time to order chocolate mice like in the book, but I figured gourmet truffles were good enough on short notice! 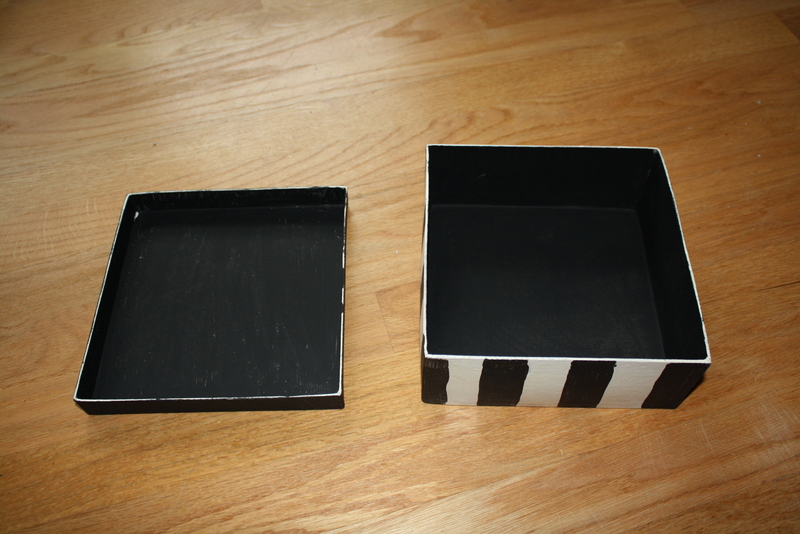 The candy store didn’t have a black box so I had to make one out of black card stock – that was fun to learn how to do. That’s tied with silver ribbon, and has a little message attached. 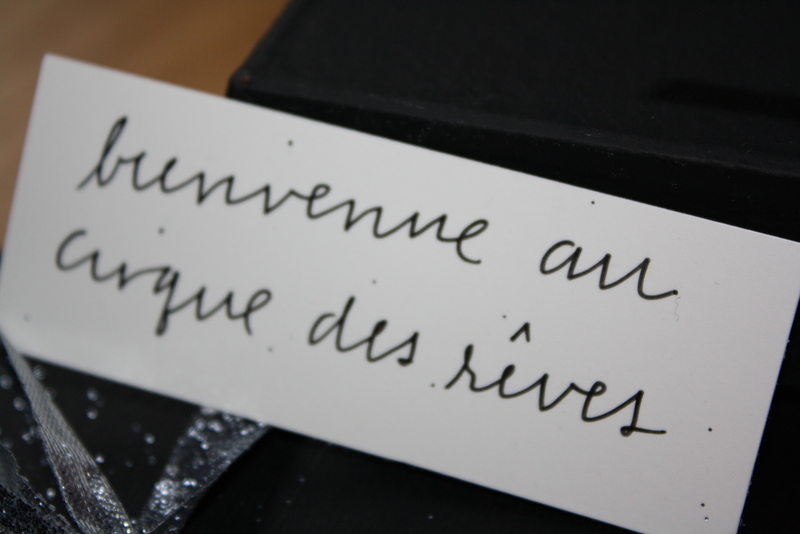 A close-up of the message on the chocolates. So here’s the gift, all wrapped up in black ribbon. 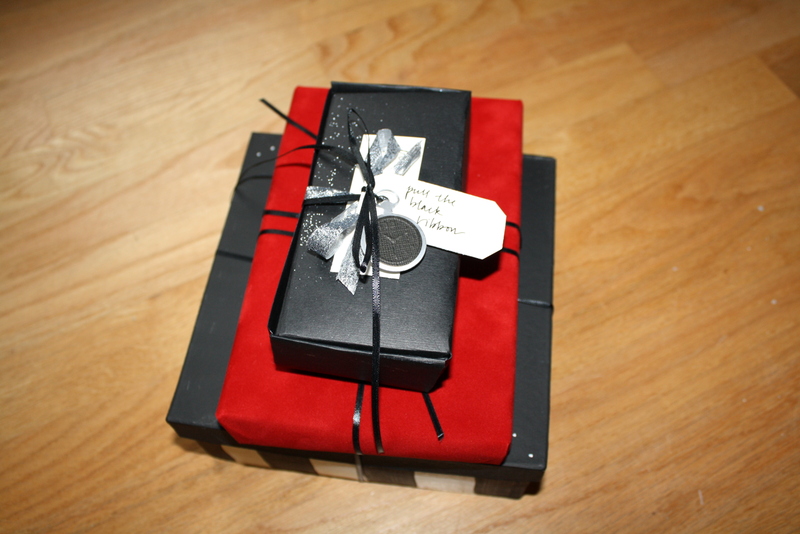 It’s got the color scheme, it’s got the pocket watches – I was SO EXCITED to give this to him. Because I’d wrapped the three boxes together with a long string of black ribbon, I figured this would help him not get tangled. So, there it is. It was definitely the most impressive-looking gift under the tree this year, and cost me very little besides time. Dad was thrilled with the gift, and I have NO IDEA how I”m going to top this next year. Generally I have a hard time shopping for people for Christmas and birthdays, but if I know they’re interested in something, elaborate stuff like this becomes easy. If you want to find out more about the Night Circus, check out the author’s website.